I think this is my favourite #12monthsofdiy project yet. Y'all know I love a thrifty find! 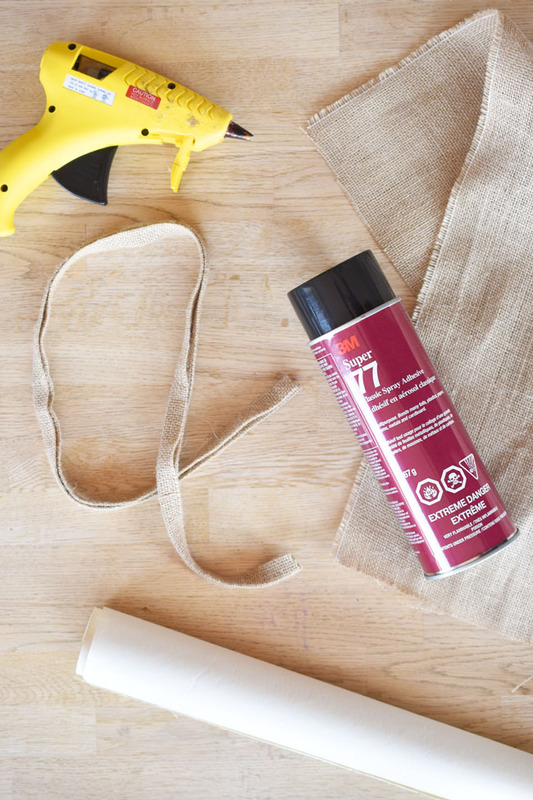 Combine that thrifty find with a diy project and we have a whole lot of fun on our hands. I enjoyed going to Value Village to find a few treasures to overhaul. 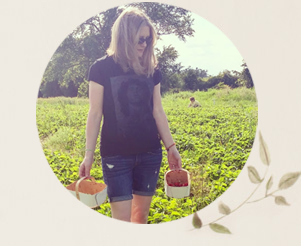 The bonus fun is that there are 11 other bloggers participating in #12monthsofdiy, so we get to see loads o' thrifty diys today. Read on for the other incredible projects. It's not news to any of us I'm sure that we North Americans can be incredibly wasteful. In fact, we throw away more than 81 pounds of clothing and textiles per person, per year. With Earth Day coming up this Friday, it's a good time to think about how we can reduce this waste. As a parent, I have often wondered why we all buy the same books and plastic toys when we could just as easily pass them on or buy them at a thrift store. Buying secondhand items is an easy and fun way to do our part to help the earth. And it saves us money too. Not a bad deal at all. 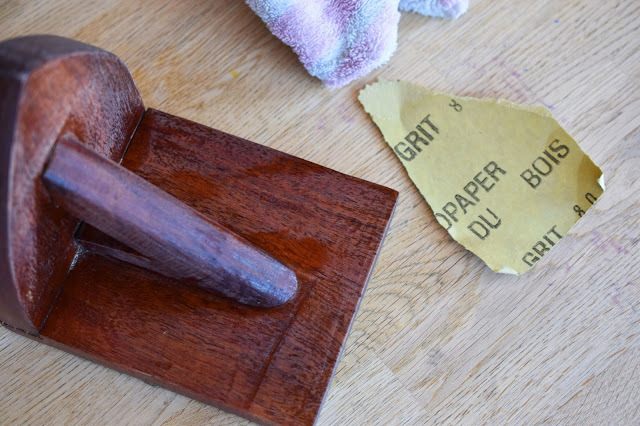 Why not make your next diy project an upcycle of a thrifted find? Value Village has over 350 thrift stores in the U.S. and Canada so there's a good chance you have one near you! My husband and I looked long and hard through all of the treasures at our local Value Village. I tend to be drawn to dishes and furniture, but of course you could also do some very nice upcycling of clothing and textiles too. We had a few ideas circulating in our heads, and then we spotted this lamp. We had to have it. I love the rustic bronze look of the base, with the attached rings. To be honest, we thought it was pretty fine as is. But I knew we could bring it up a notch too. I love books so I guess it makes sense that I also love bookends. 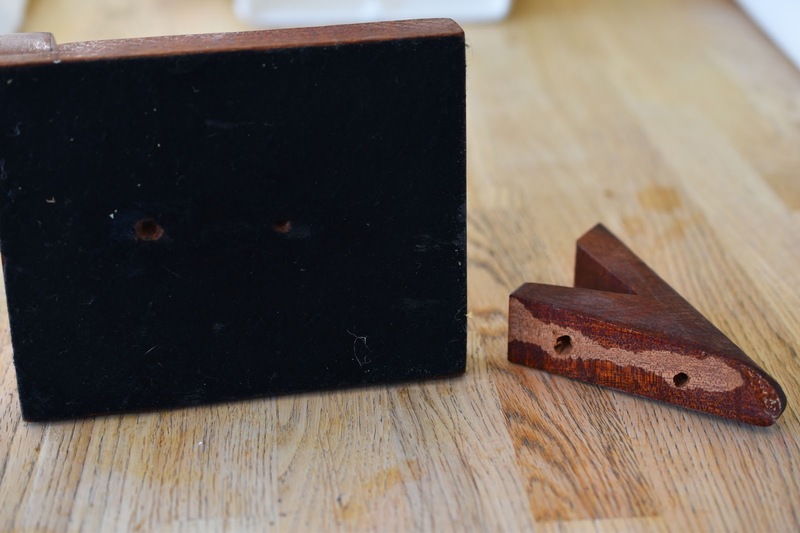 We spotted these brown wooden bookends and felt that they were a bit dated in style and finish. Not too far away on another shelf we found our solution - Mr. Owl here. 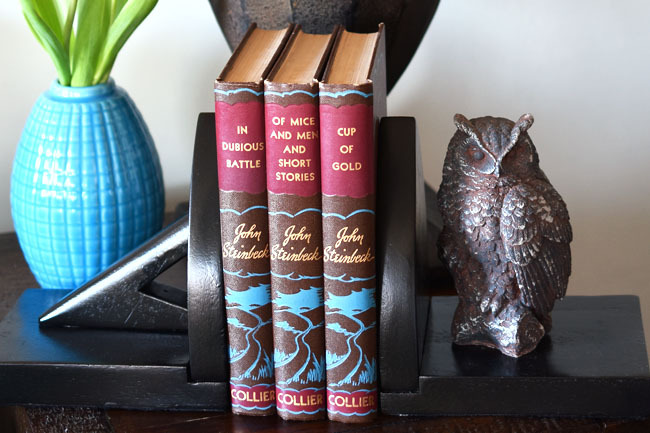 I don't think my fascination with owls will ever get old and this wise little fella is particularly nice and weighty - just the thing to add to our dated bookends! The lamp shade, although passable, was a smidge dull. We wanted to jazz it up a bit. And you can see that the glue holding the original trim on had aged. It was very easy to pull off all the trim. I thought about wrapping the lamp shade in twine or perhaps spray painting it, but then suddenly I just felt burlap was the way to go. I turned to Pottery Barn for some style inspiration and found a number of burlap lamp shades on their website. 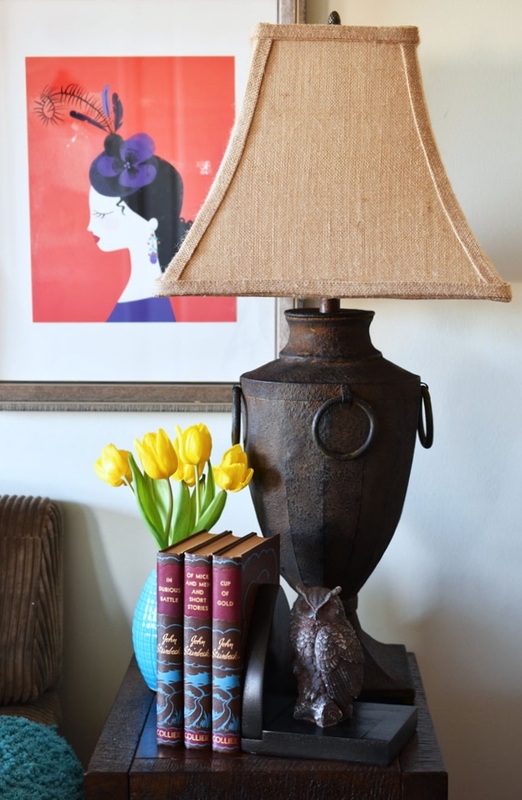 I googled burlap lamp shade projects to get an idea of how others had re-covered their lamp shades. Unfortunately every single project I found involved a rounded lamp shade. That left me wondering how difficult it would be to cover this rectangular, angular lamp shade. I felt that wrapping the fabric around the shade as most people had done with their round lamp shades wouldn't be the best course of action. After consulting with the husband, we agreed we should cover each side individually and then use burlap trim to hide the edges. First we took the lamp shade off the lamp and stripped off all the old trim. 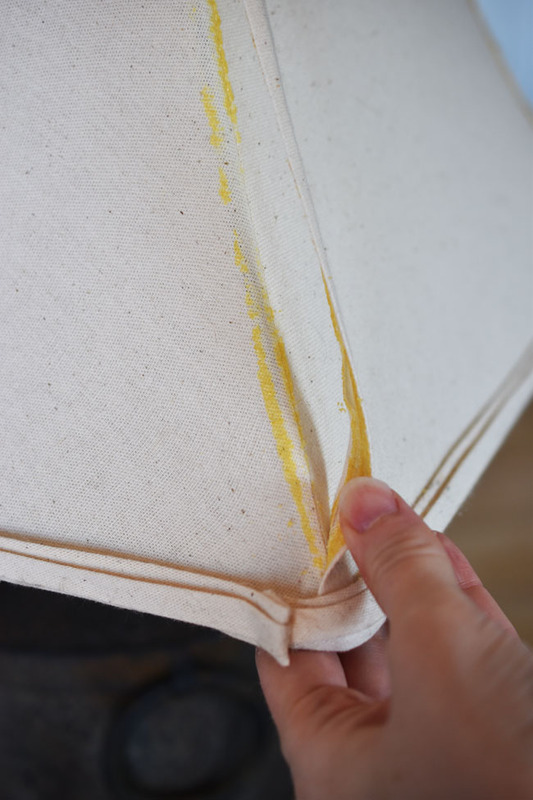 We made a paper template of one side of the lamp shade by placing the paper over the shade and creating folds. (We made the template a few inches longer than the shade to allow for the material to wrap over the top and bottom.) 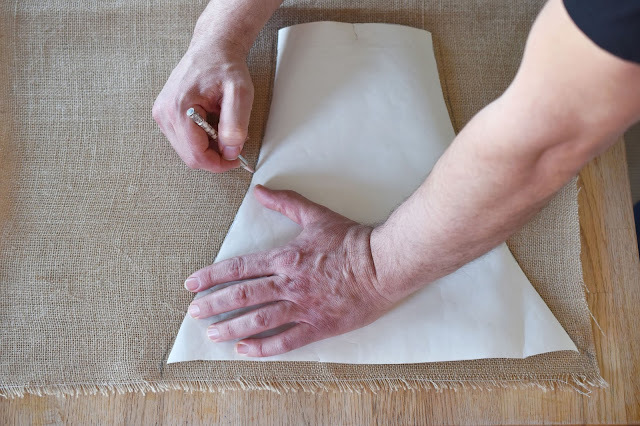 We then placed the paper template over the burlap and traced the shape onto the burlap with a pencil. We cut out four pieces of burlap, one for each side of the shade. The one in the picture, above, was our first piece. See how the pattern of the burlap kind of waves? That ended up bothering us, but we simply positioned that side at the back of the lamp. The other three pieces of burlap are more even in pattern. 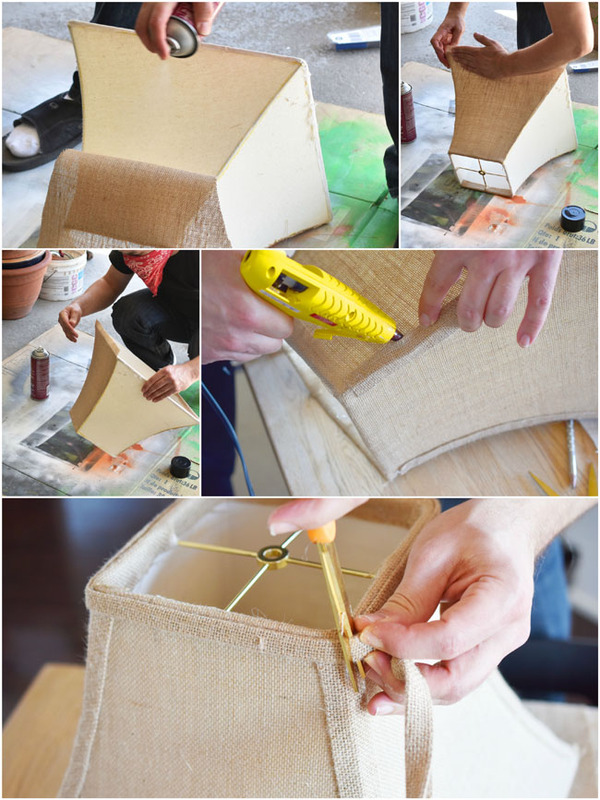 We positioned the burlap and hot glued the top onto the shade before proceeding with the spray adhesive. 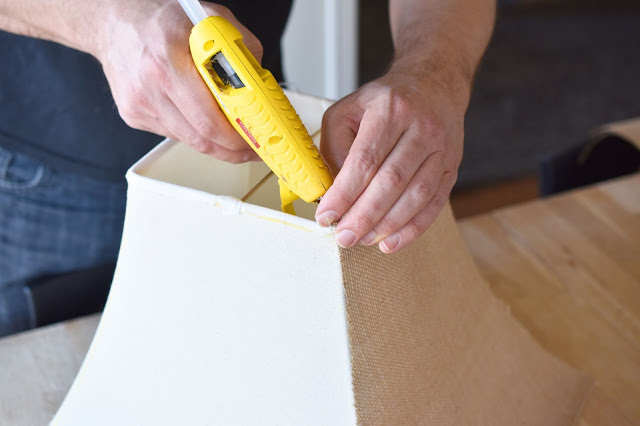 Spray the adhesive along the lamp shade smoothing the burlap fabric down as you go. 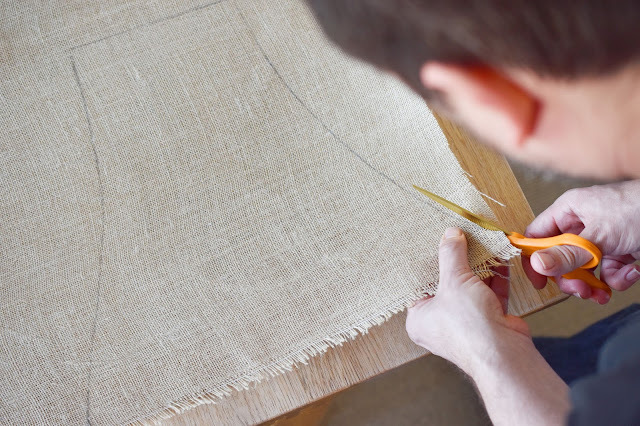 Cut four pieces of burlap trim to cover each vertical edge of the lamp shade. (We opened up one fold of the burlap trim to do this.) Hot glue the trim down each edge to cover where the panels of fabric meet. 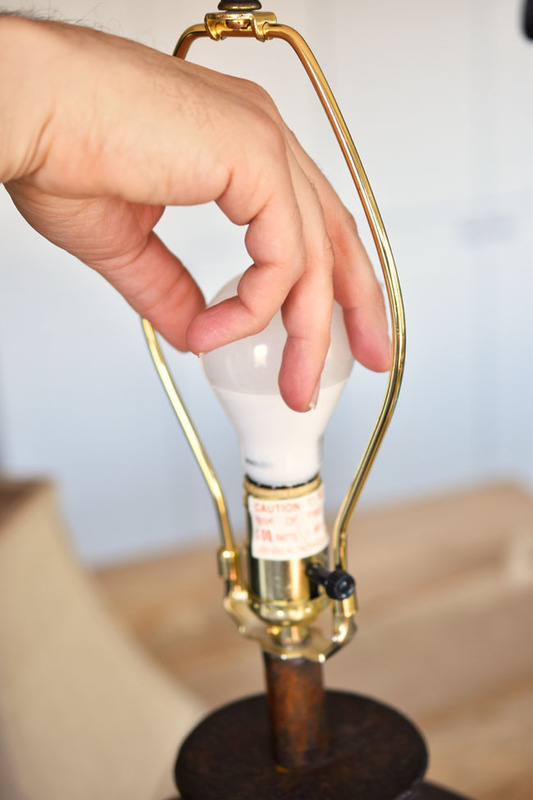 Lastly, we replaced the previous light bulb with an energy-efficient Philips LED (60 watt replacement) soft white light bulb. And here is the lamp shade, all prettied up! We're sort of proud of our Pottery Barn-inspired burlap lamp shade diy. What do you think? 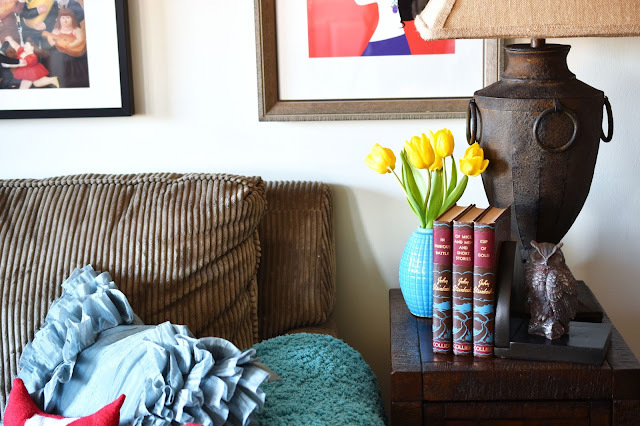 A Pottery Barn-inspired lamp needs Pottery Barn-inspired bookends right? This next project could not be easier! 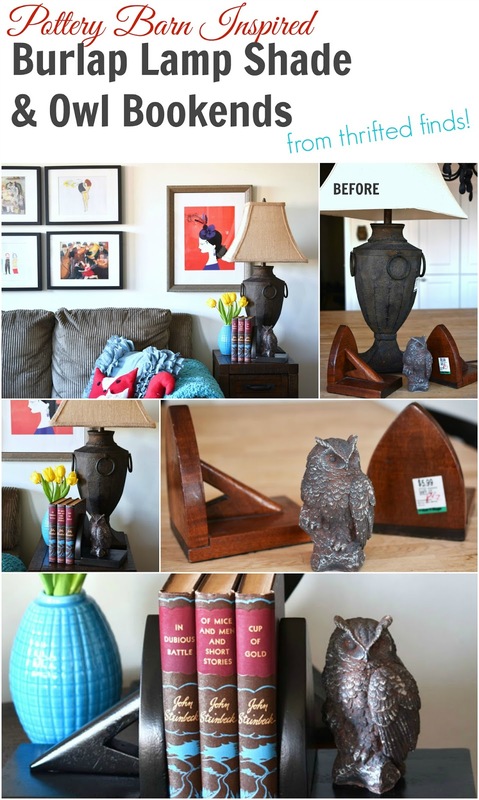 We decided to simply spray paint the old wooden bookends (and possibly the owl). 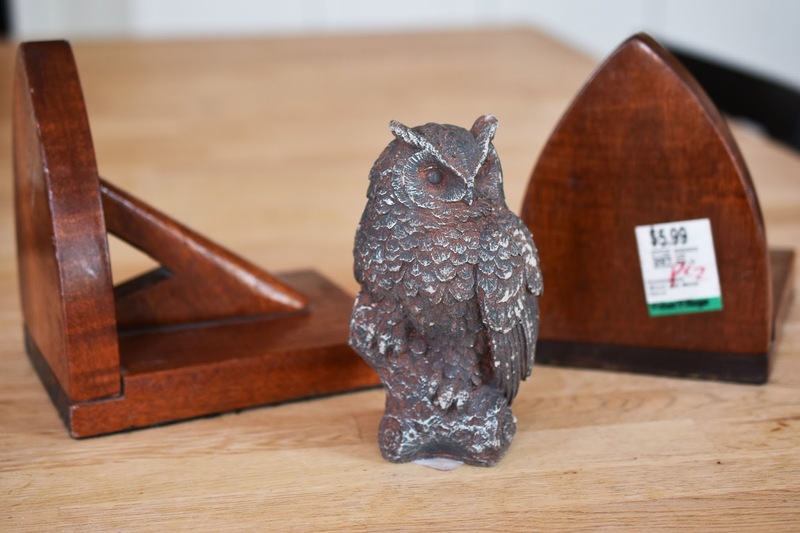 We first removed the diagonal decorative wooden piece from one bookend to make space for Mr. Owl. We bought new felt to replace the old felt, but really we only had to create two holes to get the screws out, so we left the felt as is. 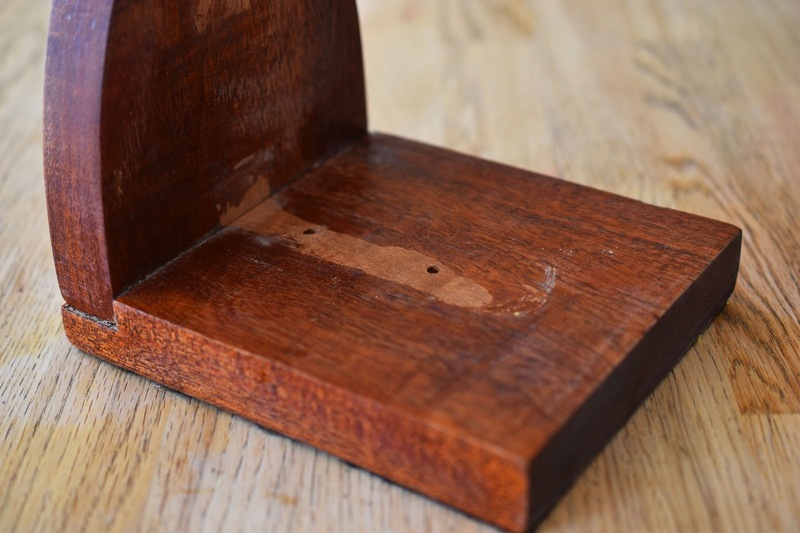 We gave both of the bookends a fairly vigorous sanding with 80 grit sandpaper. I think the paint would probably work without sanding but we wanted to be sure. 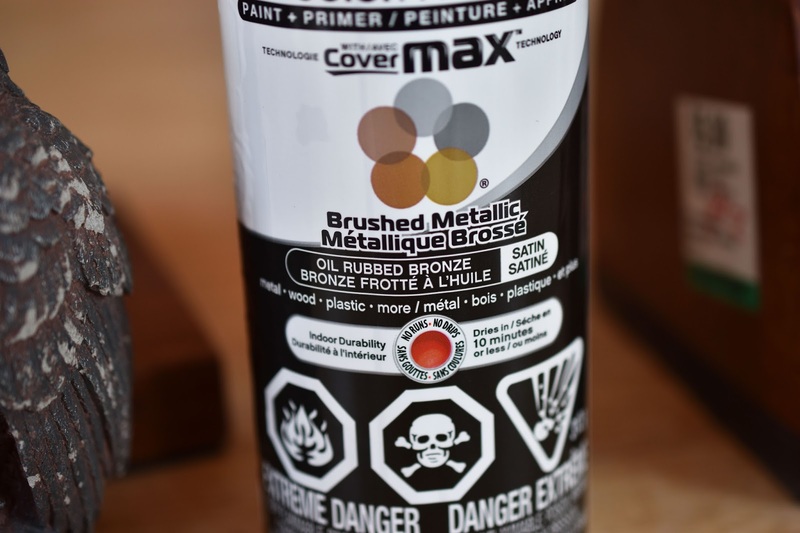 This Krylon ColorMaster Brushed Metallic Oil Rubbed Bronze Satin (whew!) spray paint has a lovely lustre. My husband and I were quite happy we chose it. It goes on very nicely too. I did the painting and I really enjoyed it. 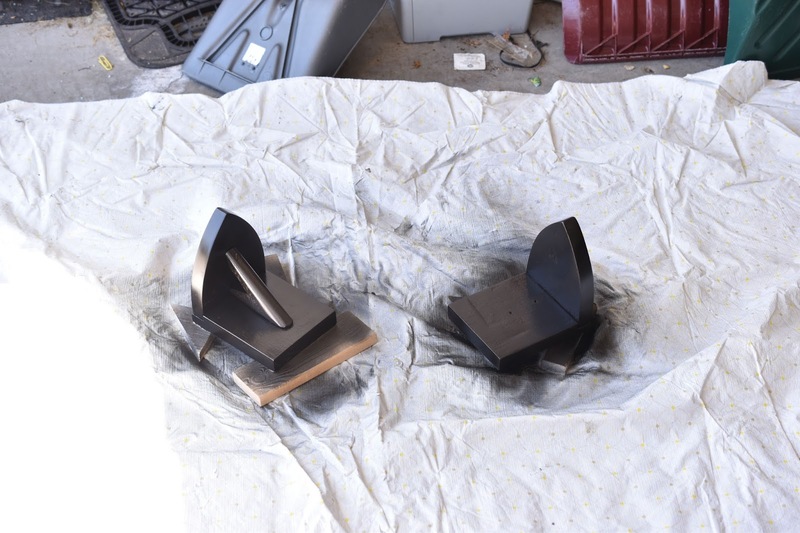 I probably did about four coats, each about a minute apart. This was a really quick and easy job. The paint dries super quick but I chose not to move the bookends for several hours just in case. 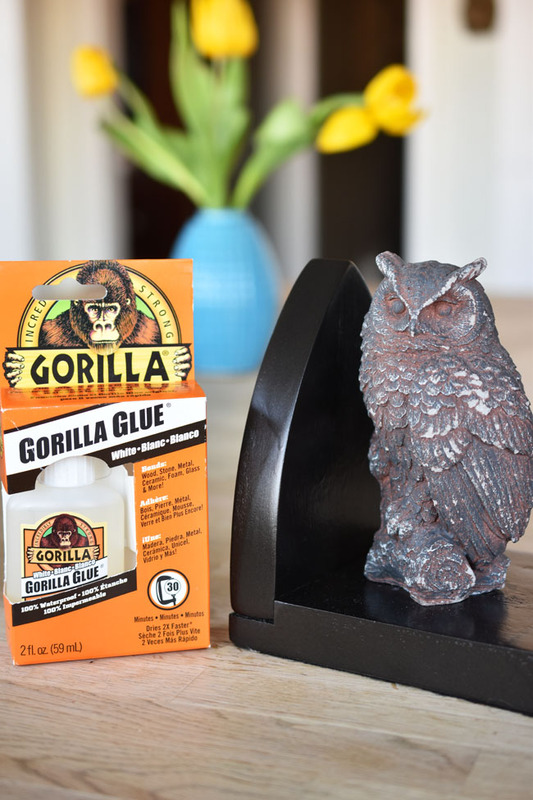 We then glued the owl on the base with Gorilla Glue. My carpenter brother-in-law recommended it once for other projects and we have found it quite useful. 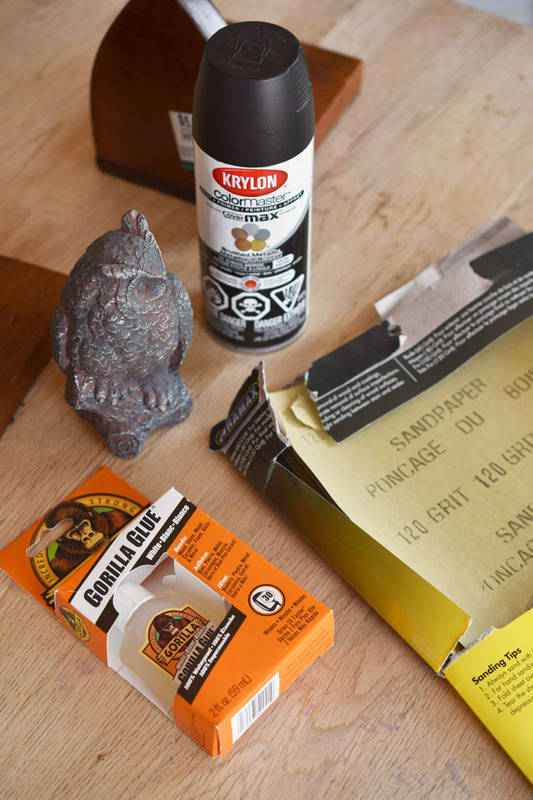 Gorilla Glue has pros and cons. Pro number one - you won't glue your fingers together because it dries more slowly than other glues! That's a big one. Pro number two - it seems to glue things together very well. The main con is that you need to clamp your two surfaces together while the glue dries. The package recommends wetting your two surfaces too. And the glue expands quite a bit so you have to be careful not to use too much or you'll find it oozing out where you don't want it to go. Fortunately Mr. Owl is heavy enough that we just had to leave him on top of the bookend while the Gorilla Glue dried. I gave it a wee tug the next day and it seems to be on there very solidly. 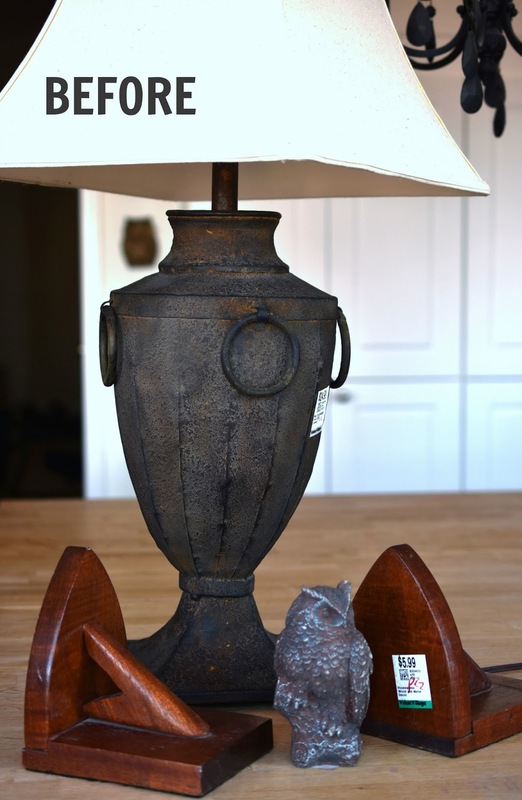 Oh, and we opted not to paint Mr. Owl because we kind of like his "rocky," weathered look, which seems to be in keeping with the rustic lamp base. Clearly we didn't have two matching owls, but I don't mind the mismatched bookends at all. They are made cohesive by the paint I think. The total invested in our Pottery Barn-inspired lamp is $55 plus tax. (We only used a small portion of the adhesive spray so we can use it for other projects as well.) Just a burlap lamp shade without the lamp at Pottery Barn is $59 to $89. Total invested is $19 plus tax. (With lots of lovely bronze paint left for other projects!) Bookends at Pottery Barn run about $40 and up. 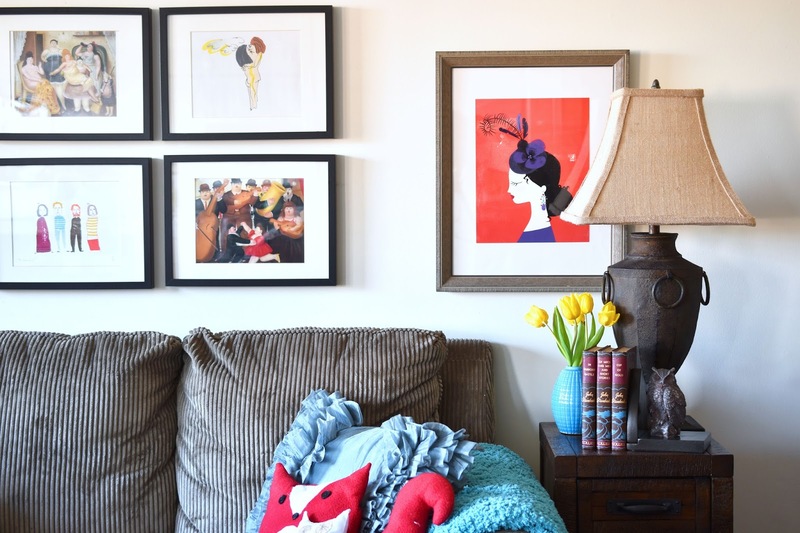 Share your own thrifty diys on Instagram using the hashtags #12MonthsofDIY and #AprilThrifting for a chance to be featured on all 12 of our accounts! Now it's time to see the rest of the DIY thrifty project ideas from my Canadian blogging friends. DIY Roll-N-Go Travel Bag from Vin'yet Etc. 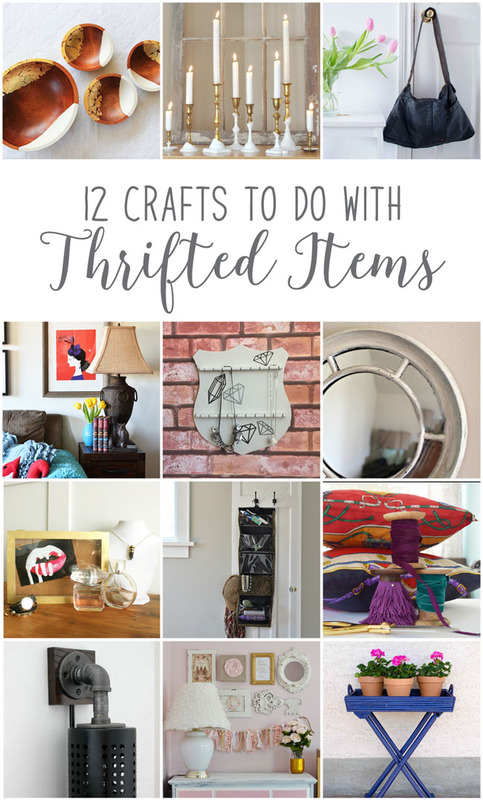 Have you done any thrifty diy crafts lately? *My thanks to Value Village for providing a gift certificate towards my in-store purchases. Any other products mentioned were purchased by Woman in Real Life and are not sponsored in any way. All opinions are authentic and my own. Love the new look! Great tips and projects! Thank you from me (Jo) and the husband! Very attractive scene! Good work. What a clever improvement for both projects! I really like the burlap lampshade! And it would have been criminal to leave that owl on the shelf in the store. It's beautiful! That was a $19 well spent. All your DIY with goodies you found at Value Village is incredible. Thank you for sharing at Vintage Charm. Love the lampshade, such a great makeover! I really like what you've done! The entire table area was re-done in a way that looks completely natural for your home. Love it! That urn lamp ain't too bad either eh?! This is so great!! I'm gonna go back to my local store and look for lampshades now! 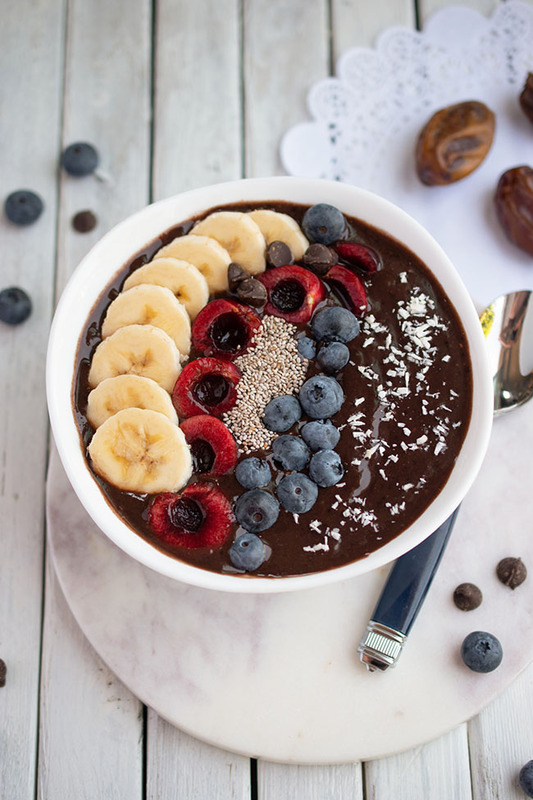 :) Thanks for the inspiration! Thank you! Absolutely, less is more in this case! I love this! 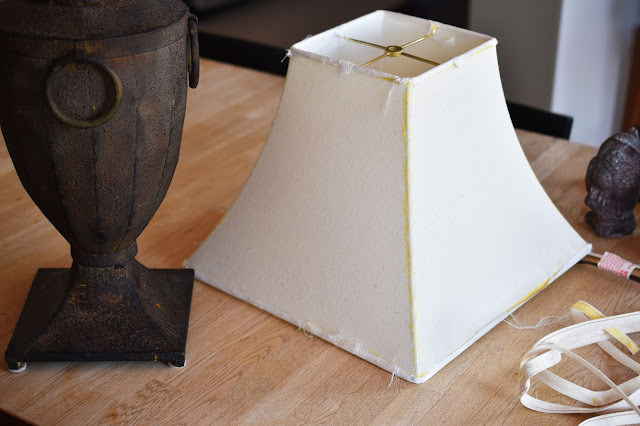 I totally want to recover a lamp shade that I have, this is a great tutorial. I think I could do it! Thank you! You totally could do this, no problem! These are great! 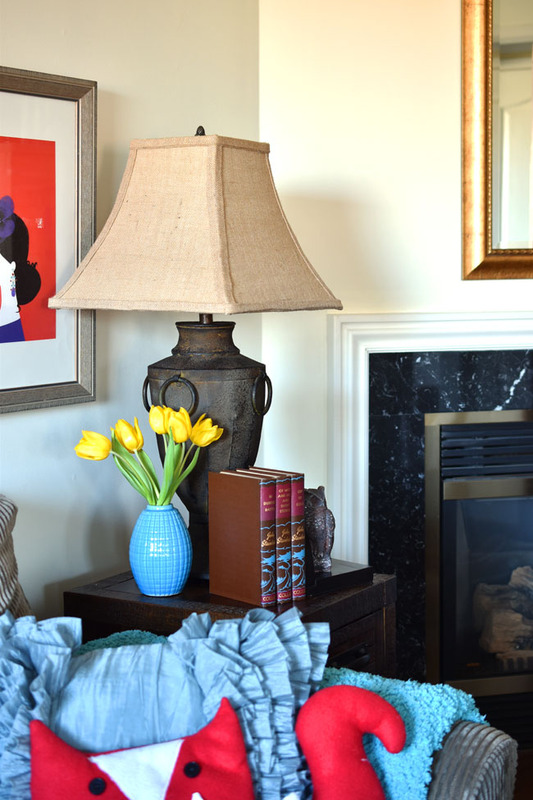 Love that lampshade -- total upgrade! JoAnn, thrifting and knock-offs are always a winning combination--great job! Good philosophy! Thank you so much!!! You really found some timeless pieces at the thrift store. I love the base of that lamp already and you're way of updating the lamp shade is perfect! WOW! First off, that lamp was such a good score. I love it! The way you made the shade is a perfect fit for the lamp. And the bookends are fantastic too!